Chapter 01 Introduction gives the importance of grammar followed by an outline of 08 ancient grammarians. The chapter includes a short outline of the Sarasvata School of Sanskrit Grammar. It also discusses the reasons behind the present study. Chapter 02 discusses the life and the probable date of Narendracarya, the author of the Sarasvata Sutrapathah. This chapter presents a comparative study of the aphorisms of this school with, those of Paninian School of Sanskrit Grammar. It also discusses the praise-worthy attempts of Anubhutisvarupacarya the author of the Sarasvata-prakriya, and Muni Candrakirti, the author of Subodhika commentary on the Sarasvata-prakriya. 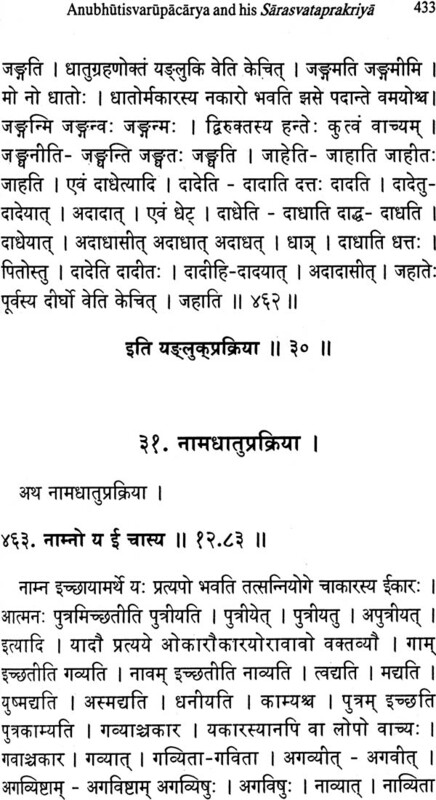 Chapter 03 deals with Anubhutisvarupacarya’s life and date as well as his Sarasvata-prakriya. 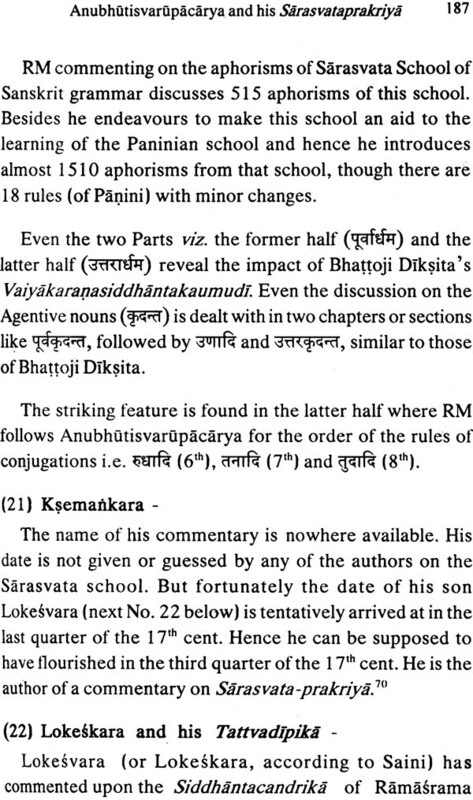 This chapter discusses the authorship of the Sarasvata Sutrapathah, because some commentators of this school ascribe the authorship of the Sutrapathah to Anubhutisvarupacarya. The internal and the external avidance are discussed and Narendracarya is proved to be the author of the Sarasvata-sutrapathah, while Anubhutisvarupacarya is the first commentator of this school. Chapter 04 is given an outline of Anubhutisvarupacarya’s Sarasvata-prakriya and a brief comparision of treatment with the schools of Panini, Candra and Katantra is presented. 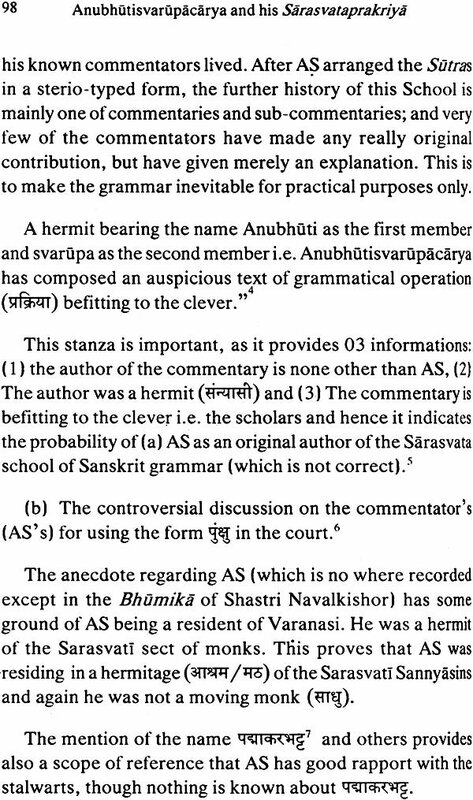 Chapter 05 presents a detailed comparative study of Panini and Anubhutisvarupacarya, their mutual relation followed by the general study of the authors of the Sarasvata School of Sanskrit Grammar. 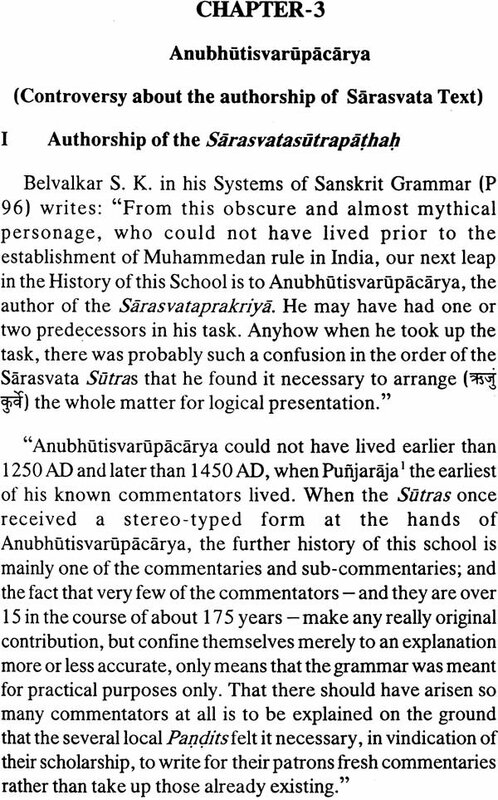 Chapter 06 focuses Anubhutisvarupacarya's impact upon the later commentators of the Sarasvata School of Sanskrit Grammar. They are Muni Candrakirti, Mahopadhyaya Vinayasagara, Ramasrama and Jinacandra. 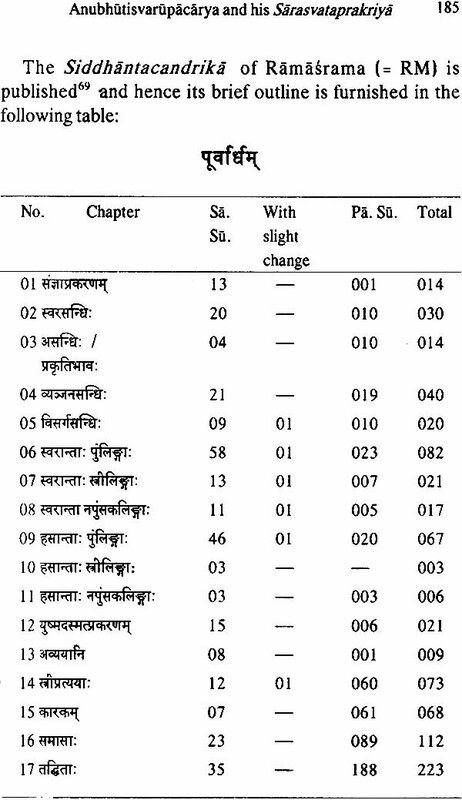 Chapter 07 brings forth the Contribution of Anubhutisvarupacarya to the field of Sanskrit Grammar highlighting his specialties and the praiseworthy efforts. 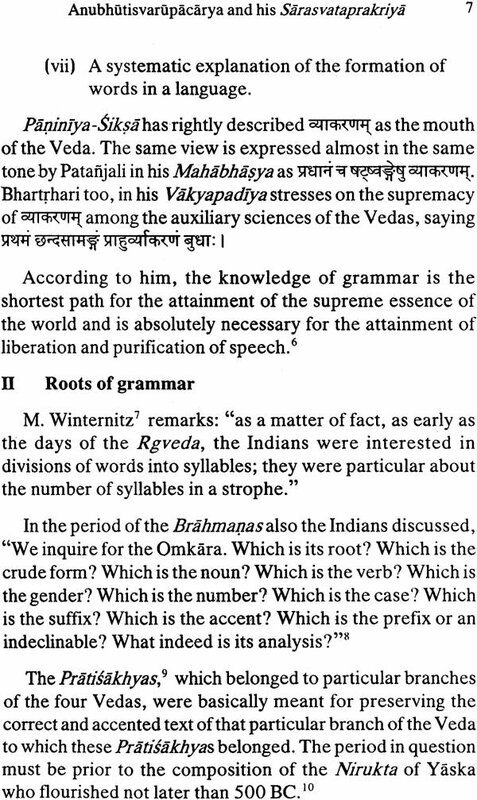 When I was studying Paninian grammar during the Shastri course (1996-1999), once my guiding teacher Prof. Dr. Jaydev Jani showed his voluminous work Bhojavyakaranam on the Sarasvata System of Sanskrit Grammar. I read the pages of introduction at one stretch and I asked him whether I could engage myself into the research in this field. Dr. Jani told me in affirmation and pointed out this topic “Anubhutisvarupacarya and his Sarasvataprakriya" (A Critical, Historical and Textual Study of the Sarsvata School of Sanskrit Grammar). Dr. Jani also added that the research in this field requires patience, sincerity, hard work and concentration which all I promised. So this book is the result of his blessings. 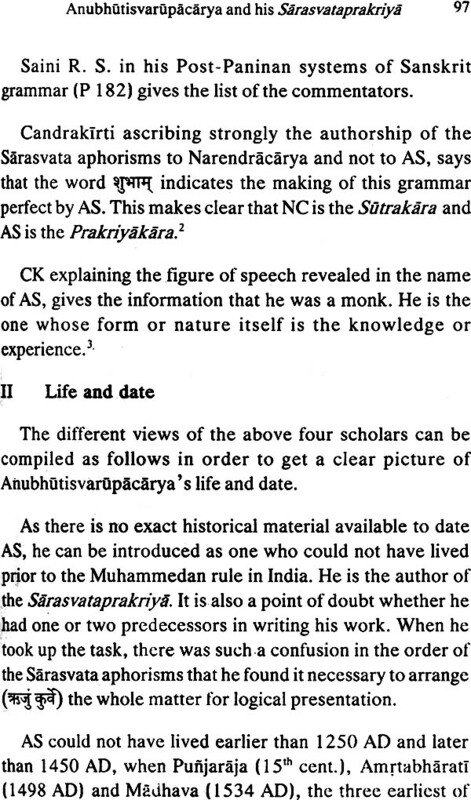 As always is the case with such research, the text Sarasvata-vyakaranam of Anubhutisvarupacarya (Pub. Nirnayasagara press, Mumbai, VS 1942) which was chosen for the present study, was not scientifically edited. The numbering of the aphorisms was haphazard. The Varttikas and the explanations were given numbering. The illustrations were misplaced and so on. 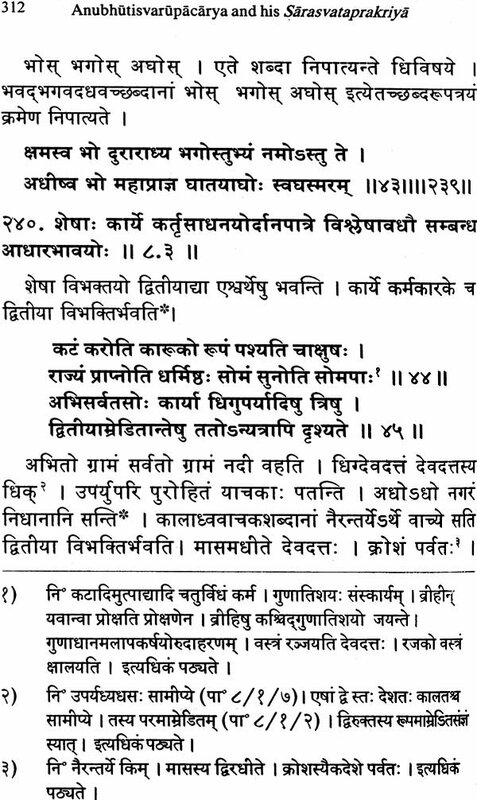 First of all the Sarasvata- sutrapathah (critical text collated with the three ms. of ORI, Baroda and one from BORI, Pune) was compared and cross-checked with the Sarasvata-vyakaranam. 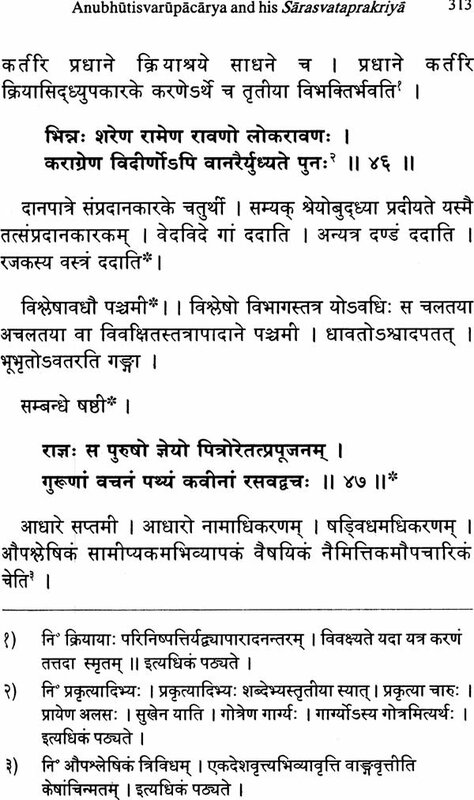 I prepared the text on the line of Bhattoji Diksita ' s Vaiyakarana Siddhanta-Kaumudi, and thus the serial numbering was taken up of the whole text along with Sutrapathah numbers at the end of every aphorism. 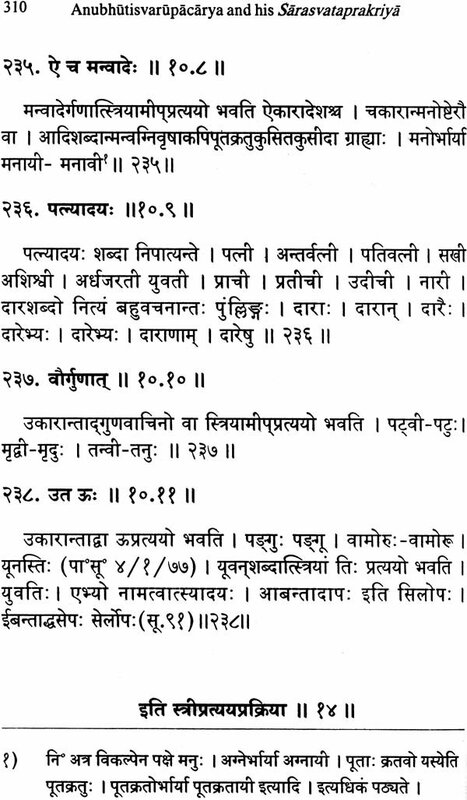 The Varttikas (furnished at the end of the Pune Ms.) were numbered serially and that number is supplied in the text. 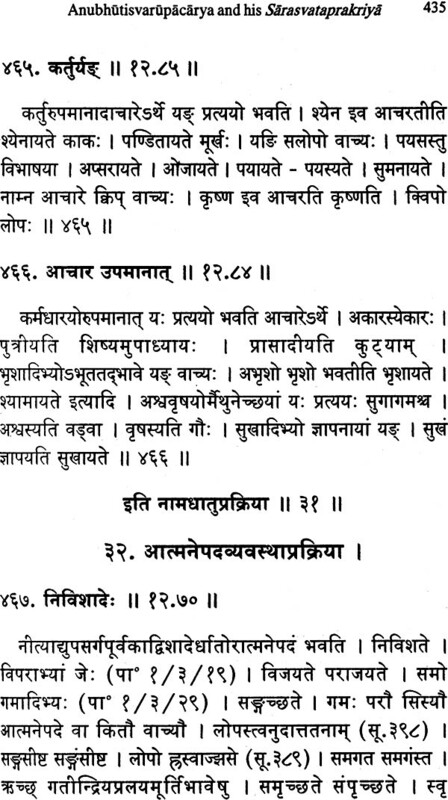 Anubhutisvarupacarya quotes karikas including verses from Srimadbhagavata-puranam, Sisupalavadham, etc. as the illustrations. They are also numbered serially, giving their references in the footnotes. 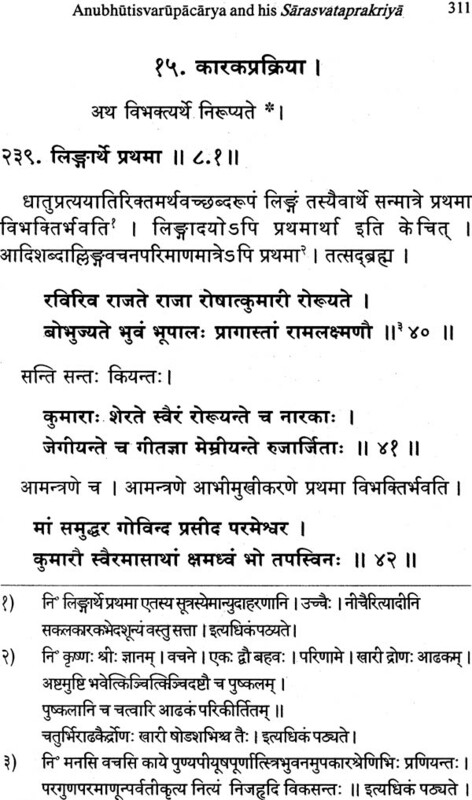 Candrakirti Muni's Subodhika(Pub. 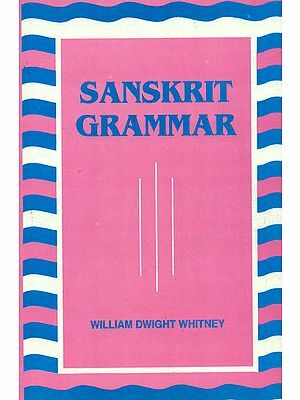 Chaukhamba Sanskrit Samsthana, Varanasi, 3rd Edition, 1985) on the Sarasvata-vyakaranam of Anubhutisvarupacarya was also available. I read and compared it with my text. Other two important works viz. 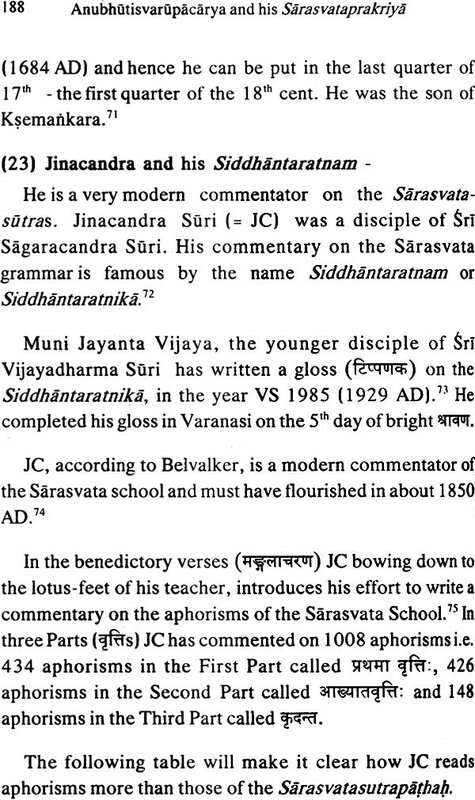 Ramasrama's Siddhantacandrika (Pub. Shree Venkateshvar Press, Mumbai, V.S. 1981) and Jinaratna's Siddhantaratnika (Pub. 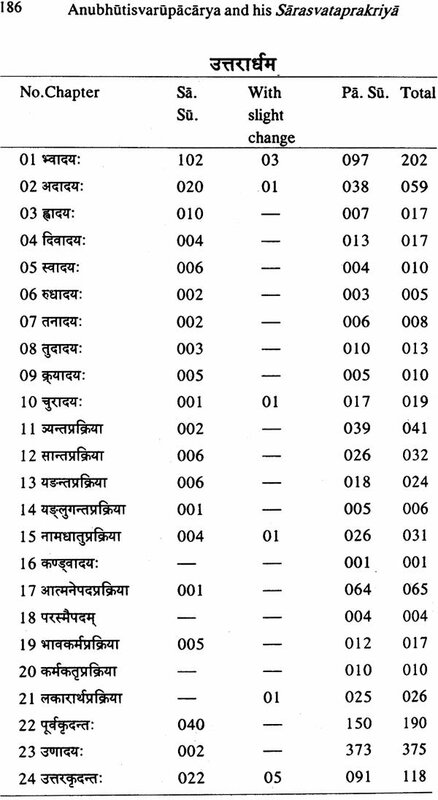 Shri Yashovijay Jainagranthamala, Bhavanagar) are also studied and their study is included in this book, too. The modern works must be noted, as they have been of tremendous help to me in preparing this book. The initial and inevitable book "Systems of Sanksrit Grammar" by Belvelkar Shripad Krishna (Pub. With the Permission of the University of Bombay, Poona, Ist Edition, 1915) is undoubtedly an epoch-making work in this field. 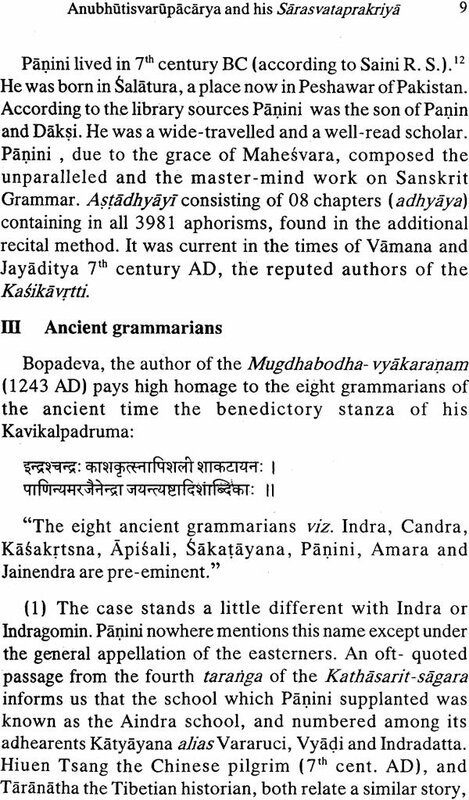 The next comes the effort of Pandita Yudhisthira Mimamsaka’s Sanskrit Vyakarana Sastra ka Itihasa (Pub. Ramlal Kapoor Trust, Bahalaghadha, Hariyana, VS 2030) and the third is Post Paninian Systems of Sanskrti Grammar by Saini Ranjit Singh (Pub. Parimal Publications, Delhi, 1999). From the Deccan College (Pune) Ms No. 239 of 1892-95 of the Sarasvatasutrapathah appended with the list of Varttikas, it can be inferred that AS must have had the texts of those accessories in his possession. The present book includes the text of Sarasvatasutrapathah edited critically with the help of 01, Pune Ms. (P) and 03, Baroda mss. (B, B1 and B2). Apart from the three mentioned above, I collected many important necessary materials from other books, journals, etc. and they are listed in the bibliography at the end of this book. Looking to the nature and the type of the area of the research the present work has been divided in 02 Parts viz. Part-I Study and Part-II Texts & Appendices so that the simplicity and the easily graspable nature of the system can be retained. Since August 1998 till the date I am quite fortunate to receive not only the able guidance but also fatherly care from my guide Dr. Jani including each of his family members. I owe him a lot, but I have no words to express. I shall never forget the wishes and blessings of Prof. Dr. M. L. Wadekar (Offg. Director, Oriental Institute, The M. S. University of Baroda, Vadodara). Prof. Dr. Wadekar has kindly gone through this book and made useful suggestions. At this moment, I am thankful to Acharya Devashree Vijay Mahanandsurishvarji Ma. Sa., Acharya Devashree Vijay Mahabalasurishvarji Ma. Sa. and Pujya Yuva Pravachanakara Acharya Shree Vijay Mahapadmasurishvarji Ma. Sa. of Shree Parshva-Padmavati Dharma Dham, Vadodara-Mumbai National Highway No.8 at Varnama, Dist. Vadodara. I am also thankful to Parama Pujya Paramar Kshtriyoddharak Acharya Bhagvant Indradinnsurisvaraji Ma. Sa. and Param Pujya Panyasa Suryodayavijayji Ma. Sa., Shree Mailapur Shwetambar Murtipujak Jain Sangh, Mailapur, Chennai and Late Shri Jayantilal Hirajibhai Bhatt and late Saraswatiben Jayantilal Bhatt of Shri Gopal Krishna Trust, Junagadh, Smt. Kamalaben Lalchand Shah, Vadodara and Shree Karjan Jain Sangh, Karjan. Without their financial support, this book would not have seen the light of the day. I thank the Authorities of the M. S. University of Baroda for giving me permission to publish my thesis. How can I forget my family members, Param Pujya late Dhirubhai Paddhiyar, Param Pujya late Narmadaben Paddhiyar, my grandmother late Parasanben Harishankar Joshi, my parents Sanatkumar Joshi and Indumati Joshi, my brother Rajesh Joshi and his wife Hetal Joshi, my father in-law Bhishmkumar Bhatt, mother in-law Bhadraben Bhatt and Miss. Ami Bhatt. Their blessings have come true. Last but not the least is my wife Punita and my son Mahiman whose constant inspiration and keeping me away from the household liabilities, have made me able to complete this book. 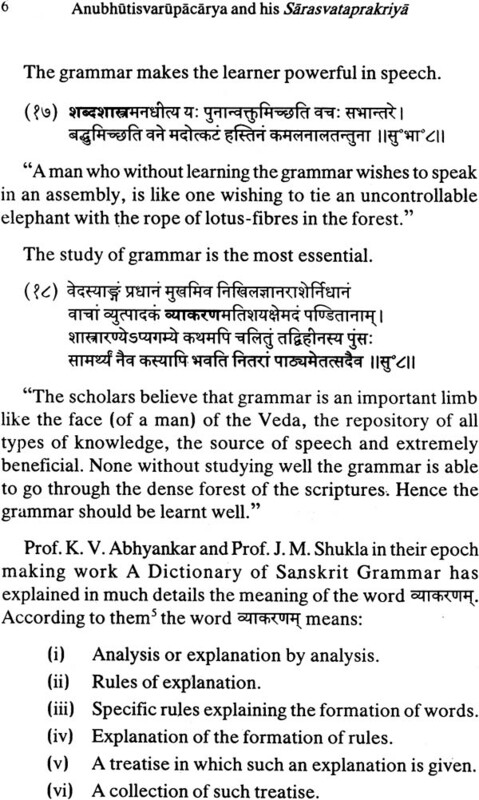 Belvalkar S. K. has written a monumental work - Systems of Sanskrit Grammar (Pub. Self, with the permission of the University of Bombay, Poona, 1915) and promulgated the direction in the field of comprehensive outlines of the Sanskrit Grammar. 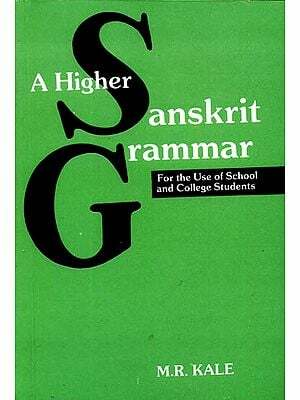 Saini R. S. has also written a book on Post- Paninian Systems of Sanskrit Grammar, (Pub. Parimal Publication, Delhi, 1999) . These two works aroused interest among the scholars and the students of Systems of Sanskrit grammar. They have presented elaborate survey of the systems in such a way that many of the Indian and foreign scholars decided to step forward in this field. The close examination of the origin and historical development process proves the fact that the works like commentaries, glosses and digest type texts are devoted enormously to the research of the Paninian school of Sanskrit Grammar. 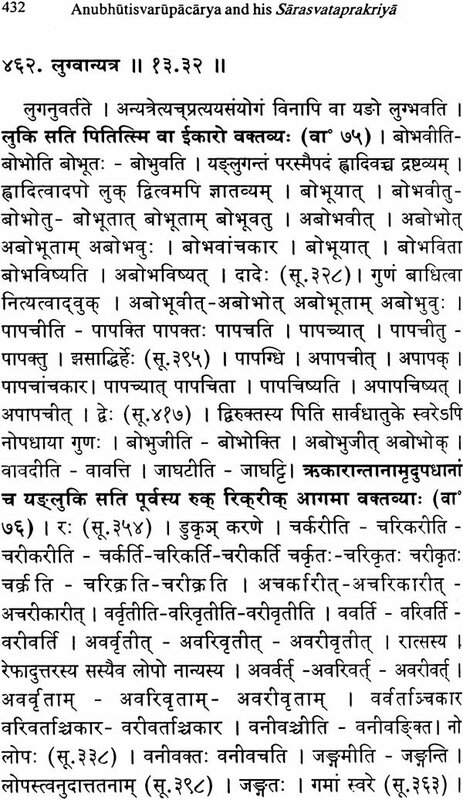 The reason is obvious that Paninian system covers almost all the necessary areas of Sanskrit Grammar. 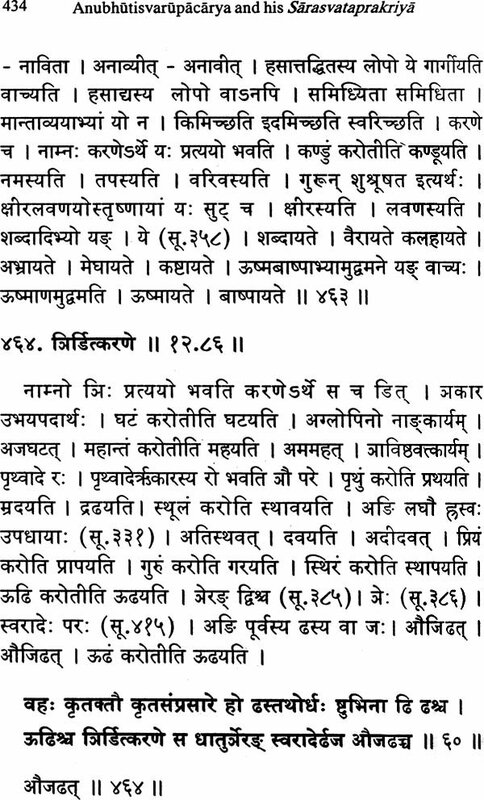 (1) Sarvavarma’s Katantravyakaranam alias Kaumaravyakaranam (2) Hemcandracarya's Siddh-haimasabdanusasanam and (3) Anubhutisvarupacarya's Sarasvata- Vyekaranam. The present work aims at the elaborate, critical and exhaustive study of Sarasvata-Vyakaranam by Anubhutisvarupacarya whose probable date is arrived at 13th A.D. The Sarasvata School of Sanskrit Grammar has double authorship viz, Narendracarya (Probably 10th A.D.), the author of the text of aphorisms called Sarasvatasutrapathah and Anubhutisvarupacarya the author of the Sarasvataprakriya - exhaustive gross. There is no doubt that the concise, compact and all applicable arrangement of the Astadhyayj composed by Panini required extensive power of memory and understanding the conciseness. The later grammarians discarding the aphorisms of the Vedic grammar, adopted simple and easily graspable aphorisms in toto and framed new aphorisms by way of either separating one into two or many or by making the aphorisms compact adding the words like adi (and its other forms). 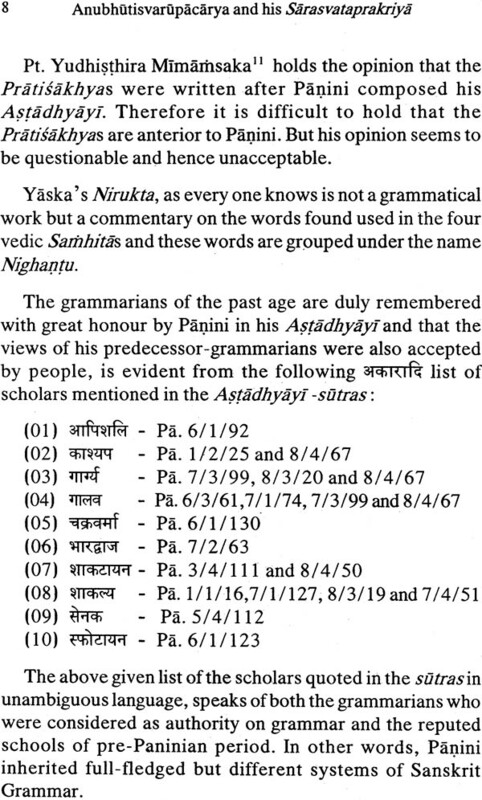 The present work comprises of various chapter on the topics like the brief survey of the systems of Sanskrit Grammar, Life and Date of the authors (Narendracarya and Anubhutisvarupacarya), the summary of all the aphorisms, the comparative study of the aphoristic arrangement and the Sarasvata Grammar with the aphorisms of Panini, Anubhutisvarupacarya text and its sources like the Varttikas, the Mahabhasya, the Dhatupathah and at many places the Nandikesvarakarikas, adding to these topics some of the relavent information is also incalculated by the author of this work. 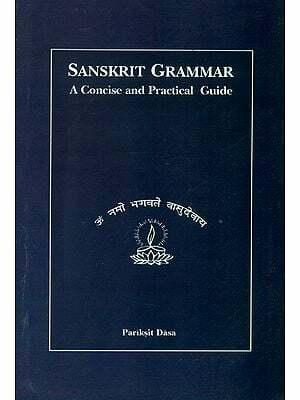 This work on the Sarasvata School of Sanskrit Grammar encompasses almost all the required areas pertaining to the Sarasvata School and therefore, those work will be a torch throwing light on the material and study of other systems of Sanskrit Grammar. 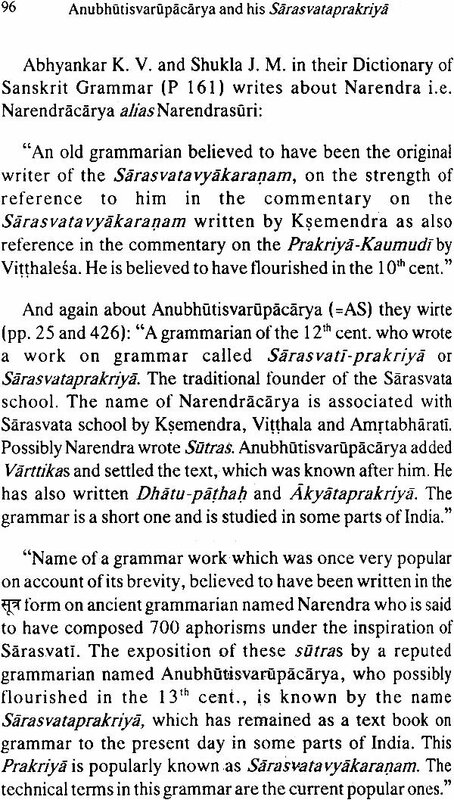 I heartly welcome this work Anubhutisvarupacarya and his Sarasvataprakriya (A Critical, Historical and Textual Study of the Sarasvata School of Sanskrit Grammar) and wish that this epoch making work will be of utmost use to the students, researchers and the scholars of Sanskrit Grammar.